LN Engineering is highly respected for its Porsche performance products, R&D and ground breaking in-house designs. 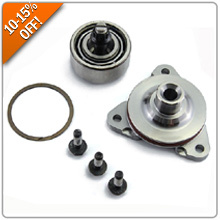 Their Spin-On Oil Filter Adapter, Spin-On Oil Filter and IMS Bearing Replacements are second to none and now you can take 10-15% off these items for your 996, Boxster or Cayman. LN will also donate 10% of the proceeds from their IMS SOLUTION kits to the Semper Fi Fund! Offer Valid: August 22, 2018 to August 30, 2018.